The generic magnetic survey is summarized in Fig. 18. The energy source is a magnetic field. The physical property of interest is the magnetic susceptibility. The data are magnetic field values. Signals are sometimes interpreted in terms of geologic units, or geologic structure (such as faults or dykes) but most often the data are inverted to yield the subsurface distribution of the magnetc susceptibility. 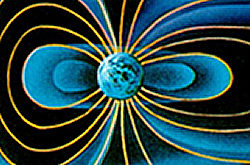 The energy source is the Earth’s magnetic field. It has a strength and direction at every location on the Earth. Subsurface materials can often be thought of as acting like a small magnetics. The material therefore becomes magnetized when a magnetic field is applied. The physical property that quantifies this is the magnetic susceptibiilty. The magnetized material creates a magnetic field (often called the induced field). The data from the survey will be a superposition of Earth’s field and the induced fields caused by the magnetization of the buried materials. 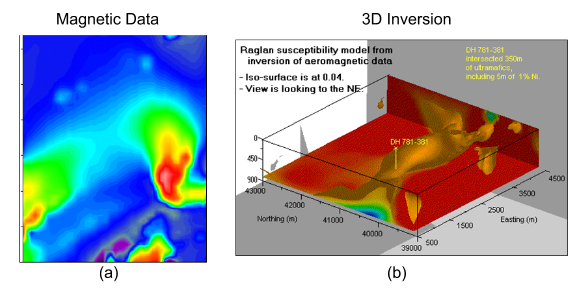 The end goal of a magnetic survey is to infer information about the sub-surface from the measured magnetic field data. The data are processed and sometimes resultant data maps can be used to infer geologic information. 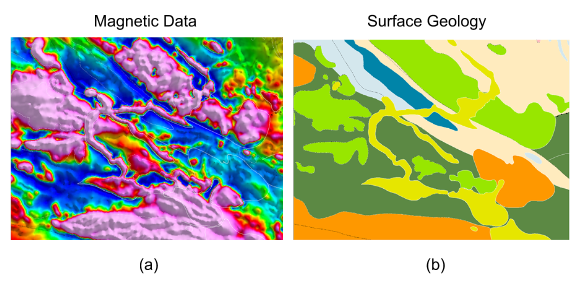 More generally, the data are inverted to generate 2D or 3D images of the subsurface. 2b. It has strength and direction everywhere. 2c. No incident magnetic field. 2d. Earth's field causes material to become magnetized. 2e. Data are a superposition of Earth's field and resulting induced fields. Magnetic data can be used in a variety of ways and for different purposes. One of the most useful is to use magnetic data for geologic mapping. The example below shows a magnetic map and a geologic map over the same area. There are many geologic units that have a distinct magnetic signature but the correspondence in not one-to-one. Magnetic data can be used for remediation and engineering work. The image below shows the magnetic data over an area that is contaminated by UXO. Each UXO has a signature like that of a magnetic dipole but the orientations are random. These data provide fairly localized information about where to dig to find the ordnance item. However, the data can be further analysed through a parameteric inversion to find the location in 3D space and also the size of the object. These are valuable pieces of information when the area is being reclaimed. Fig. 20 : (a) A typical UXO site. There is no surface indications of ordnance items. 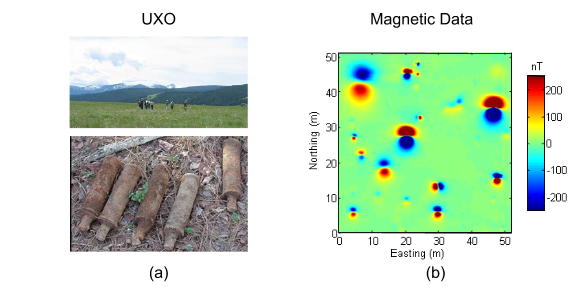 (b) Typical ordance items (c) Magnetic field data over a site contaminated with UXO. Magnetic data are also routinely used in mineral exploration. In this application however, the data must be inverted to recover information about the structure of the deposit at depth. The ability to extend surface information into depth is one of the most valuable results to be obtained from geophysical data. Fig. 21 : (a) Magnetic data map with the earth’s field removed. 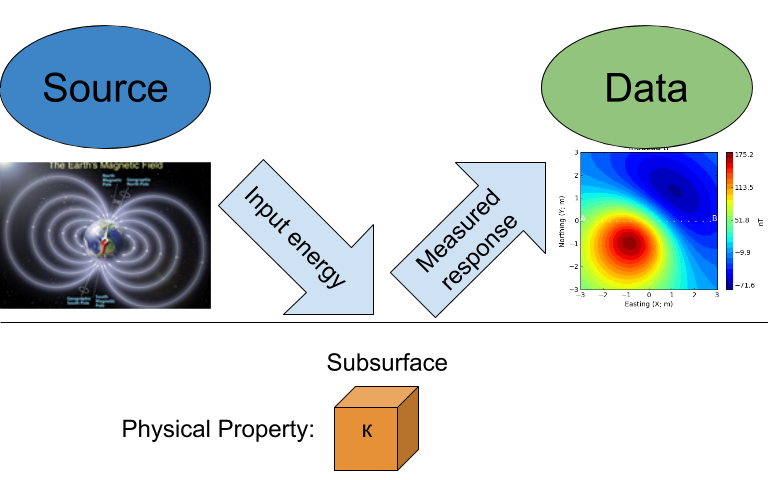 (b) A volume rendered image of the 3D magnetic susceptibility obtained by inverting the data in (a).